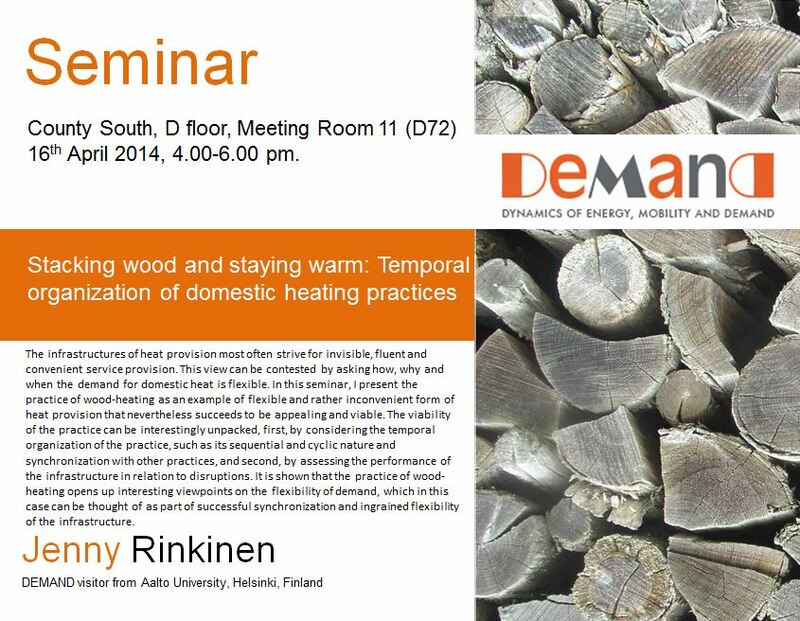 Jenny talked about her research on using wood to heat homes in Finland. Heating with wood happens at different scales and takes different forms. There are central heating systems that use wood pellets rather than coal or oil for fuel and that provide an even heat throughout the home. And then there are log fires. These need regular attention and they provide more localised and more variable forms of warmth. Although ‘wood’ is a common feature, the rhythms and systems of provision are not at all the same. Wood – in the form of logs – needs to be cut, split, moved and stored – there is a temporal ordering to domestic ‘wood management’ practices which is matched by other rhythms of setting and lighting the fire, and clearing out the ash. Other more industrialised systems of provision ‘flatten’ these rhythms. At the same time, they seem to reduce flexibility – it is harder to respond and adapt when a large, centralised system fails than when there is scope for the householder to adjust the fine grain details of their own wood management. In this respect, infrastructures and systems of provision make and minimise forms of vulnerability at different scales and matter for the meanings of ‘peak’ loads, for storage and stock piles, and for how these are arranged. These observations led us to think more, and harder, about the relationship between systems of provision (from tree to ash) and the technologies and infrastructures involved and it led Greg, in particular, to wonder about the parallels between petrol (for cars and lorries) and wood (for stoves). Wood has some material properties that are relevant for how it is used (weight, bulk). However, the type of stove and the structure of the supply chain are also critical for the production of heat, and for the practicalities and temporalities of energy demand. 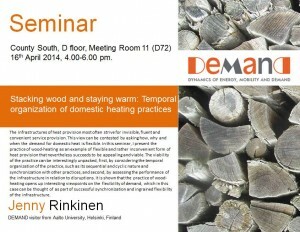 This entry was posted in Seminars and tagged heating, seminars. Bookmark the permalink.